Who better to write the companion installment of New Jersey Pizza Week than the man who introduced me to the wide variety and excellence of New Jersey pies, Dan Cichalski? 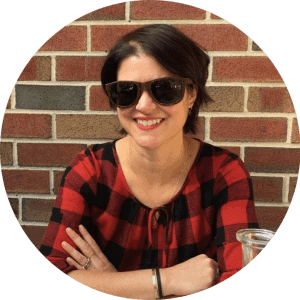 They always say to write about what you know…. Back when I was a young newspaperman on the Jersey Shore, my co-workers and I would often put the Monday sports section to bed on Sunday night and find that we still had time to zoom over to Neptune. There, in the little town south of Asbury Park (where did you think it was? 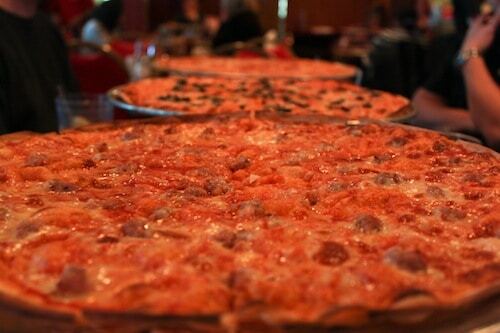 ), we would walk into Pete & Elda’s with just enough time before the kitchen closed at 1:00 a.m. to grab seats at the bar and place our orders for their renowned thin-crust pizza. It was the perfect way to cap a weekend and finish off the work “day” following Sunday Night Football. On Sunday nights just before closing, we had no problem finding three or four seats together at the bar, and the restaurant area was usually closed. 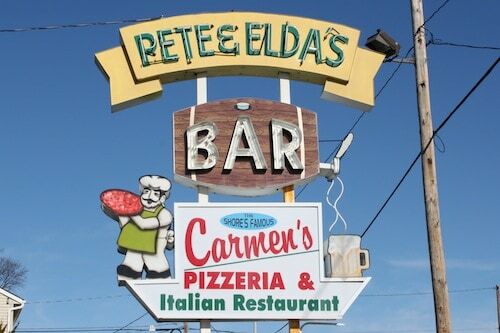 But that may be the only time the place could be described as “empty.” Whether it’s a summer weekend or winter weekday, if it’s a reasonable meal time, Pete & Elda’s Bar and Carmen’s Pizzeria (its given name, though everyone simply knows it by its first names) will be hopping. Just be sure everyone in your party arrives at the agreed-upon time, because the staff will only seat full parties, no matter how much your growling stomach protests. Pete & Elda’s remains a legendary outpost on Route 35, particularly among the high school sports set, for its participation in the time-honored American tradition of Eat This, Get a Free Shirt. If you can polish off an entire XXL thin-crust pie by yourself, the staff will bestow upon you one of its latest T-shirts (scroll down for photos). Many a football or field hockey team has entered, and many a player has exited with an addition to his or her wardrobe that quickly became part of the gym class clothing rotation. I, however, was never one of the skilled ones. Even as a twenty-something former cross-country runner, the best I could do was wolf down an XL pie in the wee small hours. It’s not for lack of trying. While I maintain an appreciation for doughy crusts, deep dish, even the occasional stuffed crust (More cheese? Yes, please! 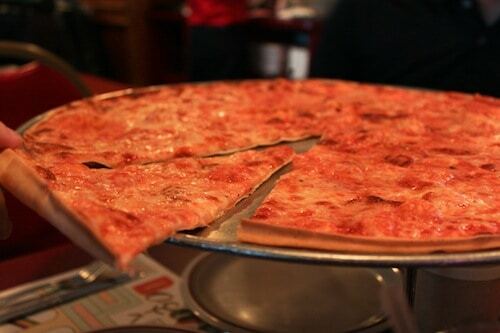 ), sometimes cravings call for a crazy thin, cracker-like crust, and I’ve had none better than Pete & Elda’s. The thinner base forces a lighter touch with the toppings, yet the ratios allow for a perfect blend of cheese, sauce, and crust—no single flavor will overpower the others. Add any additional accoutrements, and you’re going to taste those, too—and you might need two hands to support the slice from the plate to your mouth. For this assignment, I ordered an XXL pie, but with no intensions of actually finishing it. I just wanted to see how close I could get. If my appetite (I skipped breakfast that morning) allowed, I just might clean the tray; if not, I’d have a few delicious slices to take home with me. Of course, that didn’t stop my companions at the table from announcing to our waitress that I would be going for a T-shirt. Feeling a need to temper expectations, I corrected them each time they brought it up. She’s right about that, but it doesn’t mean I won’t try again.